Once the meeting I traveled for was finished on Thursday, I made an evening trek to MacArthur Beach State Park in North Palm Beach. My main goal was simply to enjoy the ocean and maybe spot a few terns. However, when I arrived, I heard that this quiet, well-designed refuge had something very special to offer: Roseate Spoonbill. Not too long after low tide, the channel separating the smaller easternmost barrier island from the larger one was extremely shallow, revealing large expanses of mud flats enticing to White Ibises, Great Herons, Little Blue Herons, and, yes, Roseate Spoonbills. These amazing, ungainly waders wouldn’t come too close, but their vibrant pink plumage popped even at a distance. 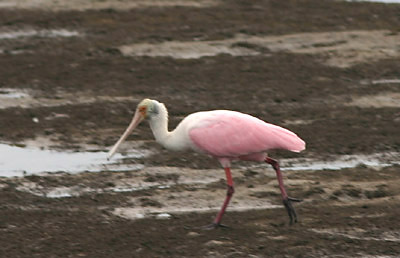 The spoonbills wielded those distinctive spatulate beaks expertly, dipping, sweeping, and slurping for food. The probing ibises and spearfishing egrets were no slouches in the hunting department either. This channel was obviously productive as, even from the boardwalk ten feet above the bed, I could clearly see needlefish, pufferfish, and mullet, that last species leaping from the water with admirable exuberance. The lush mangrove habitat lining both banks of the broad channel seemed decidedly bereft of any bird smaller than an ibis. It did shelter a variety of other interesting animals, including lizards, raccoons, and big, beautiful Blue Land Crabs. The beach was also pretty barren, a much more lonely and unattractive stretch of sand than I anticipated. Though I watched for some time, all that appeared were a handful of Royal Terns, Laughing Gulls, and Brown Pelicans, along with a Yellow-crowned Night-heron looking extremely incongruous against the surf. As superlative the Sunshine State is for birds that love to wade, paddle, or dabble in effluent-filled waters, it seems equally inviting to invasive avifauna. Besides the previously mentioned parrots, I observed Eurasian Collared-Doves, Common Mynas, and who knows what else in my day-to-day travels. Many of the surprise species that pop up along the road are birds blown in from the Caribbean. A perfect example of this phenomenon happens to be the last new birds of my sunny Florida sojourn, a trio of Gray Kingbirds hanging out like hooligans at he intersection of Route 1 and A1A. They may be common in Puerto Rico, but if you want to spot these kingbirds and other tropical treats in the United States, the Palm Beach area is the right place to be.